But it can't be from Dolly Clackett. She gave me an Easter egg! : So you're my replacements! A dandy and a clown! For the sake of fairness, I really should start this blog off by saying that I have NO CRAIC at all, seriously. It's going to be quite a boring one, but the next wee while is going to be really busy and I might not have the chance to update too much, so there we are. In my defence, it has been a super-busy couple of days. The projects I'm working on have kicked into gear and there is a lot of work to do in a short space of time. My job doesn't normally involve a lot of printing and photocopying, but it is what I have been doing a lot of for the past week. I had a very long day on Monday, leaving the house at 7am and not getting home until after 8pm. I consoled myself on the long day by buying a sandwich and a vanilla macaron from Paul on my way home, which was amazing. 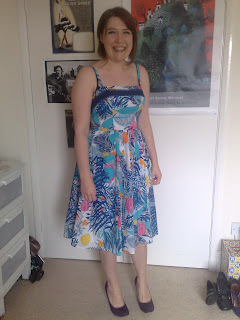 Fever Copacabana sun dress and my new Irregular Choice Matronix shoes. Hurrah! I am very pleased with this dress, it isn't one that I would have naturally gravitated towards in the catalogue, but I love how it looks on and I think it is very flattering. 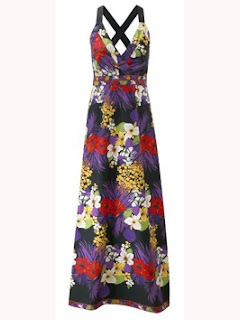 I'm looking forward to being able to wear it in the summer with sandals, rather than covering it up with my cardigan (not pictured, but I have a lovely bright pink cardigan from M&S to wear with it) Speaking of cardigans, actually, I bought a lovely purple one yesterday from Warehouse. It was reduced, and I've been eyeing it for a while, so I was very happy. At least, I was until I caught sight of my face in one of House of Fraser's billions of mirrors and realised I looked ghoulish with tiredness! Scribble dress. I tried this one on in Aspire on Saturday and, I think it might need a wee bit of alteration at the top, but the skirt is so floaty and gorgeous! 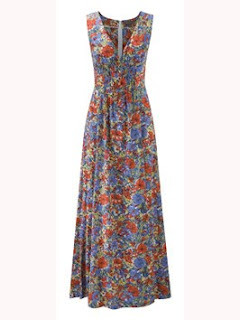 Amazon maxi dress. The picture doesn't really do this lovely justice, but it is very glamorous. As I have been spending LOTS of time on the trains over these past few weeks I have been getting lots of reading done. I picked up Some Tame Gazelle by Barbara Pym in The Works last Sunday, and read it very quickly. It was her first novel, and is characteristically delicate and funny. It tells the story of two spinster sisters and their romantic notions. As with her other novels, she writes very humorously about social niceties, and rivalries, and feeling awkward, and quite often I found myself laughing out loud. After that, I very quickly read Being Committed by the wonderful Anna Maxted. It was one that I found difficult to put down, because it was so good. I won't describe the plot, but I will say that her novels are well worth reading. They are quite different to the kinds of novels I usually read, but I have read three of her novels now and loved each one. I'm at a bit of a reading loose end right now, I'm going to have to have a poke around my bookcase and see what is waiting to be read. I need to get back into my writing as well - I've had a bit of a break from it over the past month or so because I've been feeling so emotional, and I didn't want my ideas to be too coloured by what was going on in my life as I want to write about friendship. I'm feeling steadier now, so I need to get back into it.